Brook Green Centre for Learning in Plymouth is an ‘Outstanding’ school for young people aged 11-16 who have moderate learning difficulties and associated behavioural, social and emotional difficulties. Headteacher Sara Jordan explains how they use Sleuth to provide the information needed to improve and support behaviour management in the school. 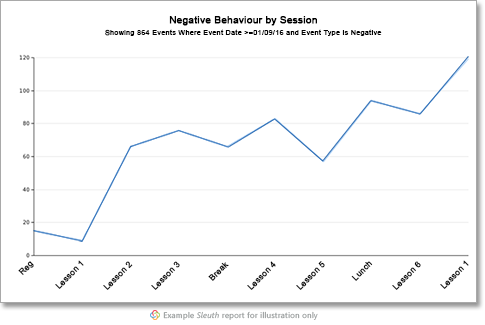 “We used to have a paper-based system for recording behaviour incidents. Each term my behaviour manager would manually sort the paper into piles, usually per student. We couldn’t analyse anything because everything was paper based, we couldn’t look at hot spots, we couldn’t look at patterns, we just had a pile of paper indicating the number of incidents per student. I’d come from a larger mainstream school where they used SIMS for basic behaviour recording but for a special school for children with cognition and learning and SEMH it just didn’t give us the level of information we need. “Because we can analyse, our approach can be really targeted now; we can target support, interventions, target work with students, target what you need from outside agencies. None of this is possible with bits of paper, your perception may be that a student is being a pain, but actually I don’t know how often or why it’s happening. With Sleuth, now I know .. because he’s got a placement breakdown, he’s going into respite and his behaviour escalates. It’s those kinds of things that you couldn’t see before, you were guessing. “We have a lot of children who are medicated and from Sleuth we know there are patterns in certain behaviours where the meds are wearing off, say by mid-morning. We’ve used this information with agencies and CAMHS who have found the analysis and detail in Sleuth really helpful because we’ve got the hard evidence on paper to show them. Sleuth supports all our work with multi-agencies actually; we regularly include reports in packs for CAMHS meetings for parents. We’ve included information from Sleuth for funding for students, used it for social workers, for health, educational psychologists, so all those professionals. In the past you were just handing over a wodge of paper, whereas now we can give them very specific and detailed evidence. “Sleuth has given us that consistent approach across the board; the expectation is that everybody uses Sleuth. It’s very flexible, we’ve adapted it around our needs so staff know its relevance and purpose to our practice and their role. 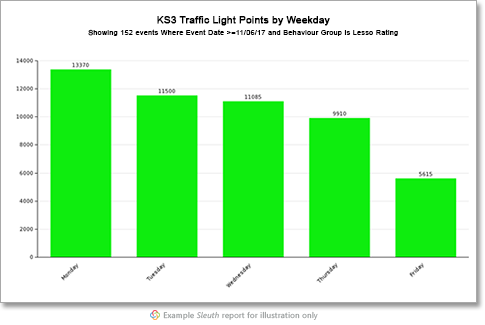 “For example, we put in our traffic light system for our lesson monitoring and then alongside that the negative and positive behaviours that we want to track. The paper based system was very punitive, we were only recording negative behaviours, now we can celebrate achievement, recognising those who are on task, respectful and their behaviour is outstanding. Our approach is much more positive through Sleuth. “We’ve given tutors the responsibility for behaviour for their group; they’re responsible for recording it on Sleuth and detailing any action taken as a result of that incident. That’s been really powerful. It’s too easy to hand over responsibility at the time you hand over a bit of paper. We’ve actually empowered the tutors by saying, “Those students are your responsibility, you need to be monitoring what’s going on.” We have setup and shared some really good reports with the tutors so they can login to Sleuth and can check and review at the end of each day. “Getting to this stage with Sleuth was a lot quicker than I anticipated. I’ve got a great staff team and they’ve been up for anything. Some weren’t confident with IT but they were receptive to Sleuth and are now more responsible for behaviour. The information they now have about pupils has help them understand behaviour so it’s added to their behaviour management skills as well. They love using their iPads for Sleuth, it’s great. I love it as well because I can have conversations with pupils and because it’s so quick for me to stay on top of what’s happening, they think I know everything! “When we first started on the journey I didn’t realise how powerful a tool Sleuth would be really. As we’ve learnt more we’ve evolved and used the information even more. We’re doing loads more with it now than we were a year ago. I think that’s a really important aspect of Sleuth, the user friendliness of it and the ease with which we can change and add new things to track. I’ve completely revamped our notes section to suit our needs, it’s just so simple to do.